Roland Minor knew early on that he wanted to become a vet. After graduating from Cambridge University, he left the UK in 1963 for his first post, in Uganda. He has since spent most of his life in Africa, holding senior government posts or practising independently in Ethiopia, Kenya, Sudan and Botswana, with a brief return to the UK in 2001 to help manage the outbreak of foot and mouth disease. He is now retired to the island of Lamu, off the north coast of Kenya. 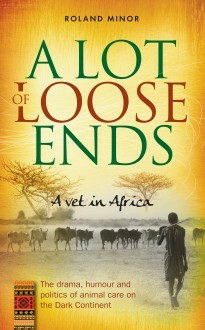 A Lot of Loose Ends is Roland’s account of his experiences in treating animals of all shapes and sizes and his many encounters with farmers, pet owners and politicians. Some of the tales he has to tell are hilarious, others hair-raising and a few horrific, but all are fascinating. He was given the 2013 Trevor Blackburn Award of the British Veterinary Association for his outstanding contribution to animal health and welfare in Africa.